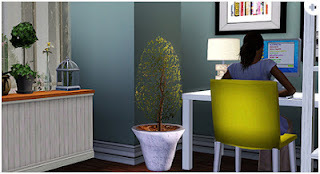 A new office set for your sims, this is a 8-piece set that comes with the desk, chair, plant, bookcase, side table, lamp, wall art, and trash can. A new nursery for your young ones. This set includes the crib, dresser, toybox, a fun ceiling lamp, rug, and curtains. This was my first set, so enjoy!